Department of Microbiology, Valliammal College for Women, Chennai - 600102, Tamil Nadu, India. ABSTRACT: Background: Biofilm is a layer like aggregates of bacterial cells which are formed on biotic and abiotic surfaces. Pseudomonas aeruginosa plays an essential role in the aggregation of bacteria on biofilm formation. Quorum sensing and extracellular polysaccharide play a vital role in the biofilm formation in P. aeruginosa. The present study was aimed to investigate the anti-biofilm effect of lyophilized extracts of Chlorella. Materials and Methods: The lyophilized aqueous and ethanolic extracts of Chlorella were screened for anti-biofilm activity by MTT assay; microdilution and antibacterial activity were assessed by disc diffusion assay. GC-MS were used to determine the bioactive compound. Results: The lyophilized ethanolic extract of Chlorella showed concentration-dependent inhibition of up to 85% in biofilm, from a concentration of 2 mg/ml to 500 µg/ml by MTT assay. The antibiofilm activity of the significant ethanolic extract of chlorella was ascertained through a scanning electron microscope. The anti-bacterial activity showed a moderate to low inhibition around the disc showing no anti-bacterial activity. GC-MS analyses revealed the presence of 8 major compounds in the ethanolic extract of Chlorella. Cytotoxic results revealed that the ethanolic extract was non-toxic from 1000 µg/ml proving Chlorella extracts to be non-toxic at all concentrations. Conclusion: Current study proves that micro-algae like Chlorella have the potential to inhibit the pathogenic activity of P. aeruginosa in biofilm formation by providing a novel alternative to the conventional anti-microbial agents. INTRODUCTION: Centre for disease control and prevention says that biofilms cause 65% of infections in developed countries. Biofilms are film-like complexes formed on biotic and abiotic surfaces by mass of bacterial cells with their extracellular polymeric substances. Bacteria present inside the biofilm communicate with each other through signaling molecules called Autoinducers in response to population density. This process is known as quorum sensing. The autoinducers released by the bacteria into the environment is very low in concentration. When sufficient bacteria are present, autoinducers concentrations reach a threshold level that allows the bacteria to sense a critical cell mass and activate or repress target genes 1. Acyl-homoserine lactone (AHL), type of molecule is the main signaling molecule in gram-negative bacteria. Bacteria prevailing in a biofilm are 10-1,000 folds more resistant to antibiotics leading to severe clinical problems and mainly escaping from the host immune system. Biofilms on the surface of in-vivo medical devices such as contact lens, artificial joints, and synthetic valves cause sustained infections. Biofilms play an essential role in the pathogenesis of the bacterium in ventilator-associated pneumonia, urinary and peritoneal dialysis, chronic lung infections in cystic fibrosis, catheter infections, bacterial keratitis, otitis externa and burn wound infections 2. Using antibiotics to control these biofilm-forming bacteria are with limited success due to increased tolerance of the bacterial community to antibiotics 3 hence demanding novel alternates to conventional antimicrobial agents. Agents with the potential to control quorum sensing or biofilm are referred to as anti-pathogenic agents. Several reports are available for anti-pathogenic agents from plants and other natural sources and synthetic chemicals. Microalgae are known for their recent interest in pharmaceutical sectors because of their multifaceted behavior and functions. Chlorella vulgaris is freshwater green algae and is one of the most efficiently utilized organisms as an excellent nutrient supplement. Chlorella has been used as food source for centuries, with high protein (40%) content and it also contains carbohydrates (20%), fat (20%), fiber (5%), minerals (10%) and vitamins. Chlorella is rich in carotenoids, magnesium and chlorophyll, and other bioactive compounds. It has not been exploited for its anti-biofilm efficacy. Hence, the present study was aimed to investigate the anti-biofilm effect of Chlorella vulgaris on biofilm development and quorum sensing. MATERIALS AND METHODS: Pseudomonas aerugionsa (MCC 2080) was obtained from the Microbial Culture Collection (MCC), NCCS, Pune. P. aeruginosa were subcultured on nutrient agar plates at 37 °C. Stocks were maintained in nutrient agar slants. Preparation of Algal Extracts: Chlorella powder was obtained from Parry Neutraceuticals, Chennai. Aqueous and ethanolic extracts were obtained as per the methodology adopted earlier 5. The obtained extracts were stored overnight in the deep freezer. The aqueous and ethanolic extracts were transferred into sterile lyophilization flasks and frozen at -80 ºC in a deep freezer. The frozen extracts were loaded to lyophilizer. The lyophilized extracts were stored in -20 ºC till evaluation. Preparation of Working Algal Concentration: 2mg of the lyophilized aqueous and ethanolic extract of Chlorella were weighed accurately. It was dissolved in 100 µl of DMSO then 900 µl of the nutrient broth was added to make 1ml and mixed completely in a cyclomixer. The stock solution was sterilized through a 0.45 µm syringe filter. Inhibition of Biofilm Formation by MTT Assay: The effect of Chlorella extracts on biofilm formation of P. aeruginosa, was examined by using the modified microdilution method as described by Teanpaisan et al., 2016 6. Two-fold serial dilutions of the stock were prepared, with concentrations ranging from 2000 µg/ml to 7.25 µg/ml. A cell suspension of the tested strains 1 × 106 CFU/ml was prepared, and 100 µl were inoculated in each of a 24-well plate containing 1ml of nutrient broth. Medium with 100 µl of inoculum, extract free medium and DMSO were used as the inoculum control, non-treated and blank controls, respectively. The minimum biofilm inhibition concentration (MBIC) was defined as the lowest concentration that showed 90% inhibition of biofilm formation. 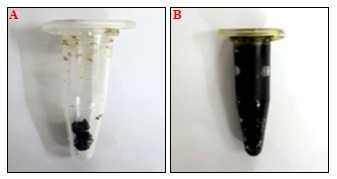 Effect of Chlorella Ethanolic Extracts on Biofilm Formation: The effect of the algal extracts against the biofilm formation P. aeruginosa were tested on 6 well polystyrene plates with a glass coverslip placed in it. The Chlorella ethanolic extracts at a concentration ranging from 2000 µg/ml to 31.25 µg/ml were added in 5 ml of Luria Bertani (LB) broth containing the bacterial suspension of 5% inoculum from the overnight cultures of P. aeruginosa. The plates were incubated for 24 h at 37 °C. After incubation, the glass slide was stained with 0.4% of crystal violet. The stained glass slide was visualized by light microscope 7. Scanning Electron Microscopic Observation of Biofilm: For scanning electron microscopy (SEM) studies, the biofilms on the glass pieces were fixed for 30 min in a solution containing 2.5% glutaraldehyde. Furthermore, the glass piece was de-hydrated by different ethanol concentrations of 25%, 50%, 70%, 100% and was incubated for 5 min between each addition. Then the sample was air dried. Anti-Bacterial Susceptibility Test: Anti-quorum sensing screening was carried out using the standard disc diffusion test according to the recommendation of the clinical laboratory standards institute 8. The disc diffusion test was performed in Muller Hinton agar (MHA) Overnight culture of P. aeruginosa was sub-cultured in a nutrient broth until turbidity of 0.5 McFarland was reached. Using a sterile cotton swab, the culture was uniformly spread over the surface of the agar plate. Absorption of excess moisture was allowed to occur for 10 min. 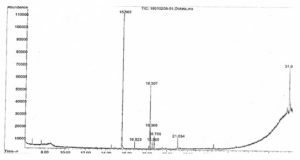 20 µl of the extracts of varying concentrations 2000 µg/ml to 15.25 µg/ml were loaded on to the sterile disc of 10 mm diameter. The discs were placed over the swabbed plates. The MHA plates were incubated at 37 °C, and the zone of inhibition was measured after 24h. Gas-Chromatography and Mass Spectro-photometry (GS-MS) Analysis: To identify the chemical constituents present in the ethanolic extract of Chlorella, the ethanolic extract was subjected to GC-MS analysis. Cytotoxicity Testing: The effective ethanolic extract was tested for cytotoxicity in vero cells from an initial concentration of 2000 μg/ml to a final concentration of 15.25 μg/ml following the methods adopted and described by Soundhari and Rajarajan 2013. This is mainly for evaluating the safety of the extract and for determining the maximal toxic free concentration 5. Lyophilization: Lyophilized products were extremely hydroscopic hence were sealed in airtight containers the following freeze-drying to prevent rehydration from atmospheric exposure. The lyophilized aqueous extract was greenish-brown in color, semisolid and was soluble in DMSO, and the ethanolic extract was dark green, semisolid and was soluble in DMSO and 95% ethanol Fig. 1. Inhibition of Biofilm formation by MTT-Assay: The inhibition of the biofilm formation of P. aeruginosa (MCC2080) by MTT-assay using aqueous extract of Chlorella vulgaris was in concentration-dependent manner with aqueous extract showing 80% inhibition at a concentration of 2 mg/ml and around 70% inhibition at 1 mg/ml and 60% at 500 µg/ml concentrations Table 1. However, the ethanolic extract could inhibit around 85% of biofilm formation at concentration 2 mg/ml, 80% at 1000 µg/ml, 75% at 500 µg/ml, 70% at 250 µg/ml, 65% at 125 µ/ml, and 60% at 62.5 µg/ml Table 2. Effect of Chlorella Ethanolic Extract on Biofilm formation Under Scanning Electron Microscope: The syringe filtered lyophilized ethanolic extract of Chlorella was tested for biofilm inhibition of P. aeruginosa (MCC2080) in concentration ranging from 2000 µg/ml to 62.5 µg/ml by microdilution method in 6-well polystyrene plate, incubated for 24 h at 37 °C showed inhibition in concentration-dependent manner which was observed under light microscope. The control of P. aeruginosa (MCC2080) on the glass piece revealed the formation of dense biofilm layer Fig. 2A. The anti-biofilm activity at 2000 µg/ml and 1000 µg/ml were found to be highly significant. The antibiofilm activity of the significant ethanolic extract of chlorella was ascertained through scanning electron microscope Fig. 2B. The anti-biofilm activity of the ethanolic extract showed significant reduction in the formation at a concentration of 1000 µg/ml showing the effectiveness of the extract. Anti-Bacterial Susceptibility Test: The lyophilized aqueous and ethanolic extracts of Chlorella vulgaris were evaluated for antibacterial activity against P. aeruginosa (MCC2080) by disc-diffusion assay. The extracts only at a concentration of 2000 and 1000 µg showed a moderate to low inhibition around the disc (10 mm) in comparison to standard (25 mm), as the quorum sensing inhibition is focused on the interference of bacterial signaling and not on bactericidal activity. GC-MS Analysis Results: The GC MS analysis of the ethanolic extract of Chlorella vulagaris revealed the presence of eight compounds. The active principles with their retention time (Rt), concentration percentage (area %) and chemical compound ID are represented in Fig. 3 and Table 3. 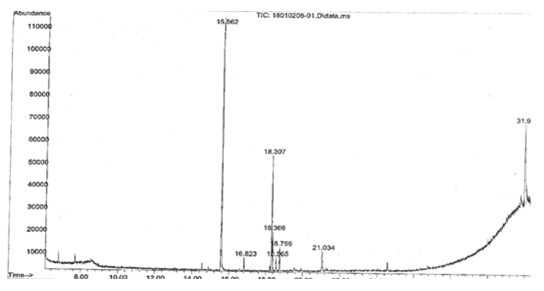 The major compounds which were reported in the ethanolic extract of Chlorella vulgaris and identified by GC-MS are Diethyl phthalate at Rt 15.563 (39.28%), trimethyl(4- tert- butylphenoxy) silane at Rt 31.944 (25.63%), Bicyclo (3.1.1) heptane at Rt 18.306 (15.95%), 2-Hexadecene at Rt 18.368 (6.04%), Phytol at Rt 21.035 (5.06%), 2- Butene- 1,4- diamine Rt at 18.758 (3.50%), Piperidine Rt at 18.563 (2.64%), 1,3-Propane-diamine, N-methyl tridecane Rt 16.825 (1.90%). Cytotoxicity: The estimation of maximal toxic free concentration (CC50) of the lyophilized extracts done on vero cell line in varying concentrations from 2000 µg/ml to 7.8 µg/ml was estimated. The extracts were nontoxic from 1000 µg/ml proving Chlorella extract to be non-toxic at all the concentrations tested. DISCUSSION: The increasing resistance of bacteria against antibiotics, an occurrence of antibiotic-resistant pathogens in the human body are the problems of using antibiotics as an antimicrobial agent. Quorum sensing (QS) is a mechanism of release and reception of signaling molecules that induce a variety of adaptive physiological changes 9. QS system plays an important role in biofilm formation of P. aeruginosa. Because biofilm resistance depends on the aggregation of bacteria in multicellular communities, one strategy might be to develop therapies that disrupt the multicellular structure of the biofilm. If the multi-cellularity of the biofilm is defeated, the host defenses might be able to resolve the infection, and the efficacy of antibiotics might be restored. Hence, the present study attempted for an alternative that would interfere with cell-to-cell communication. Lyophilisation is a method which enables concentration of compounds by evaporation under pressure and low temperature. It is an excellent method for preserving a wide variety of heat-sensitive materials such as proteins, microbes, pharmaceuticals, tissues, and plasma. Hence, the study used lyophilized extracts. There are several reports available for anti-quorum sensing activity from plants and few algae like Spirulina, Anabena, etc., the usage of Chlorella for anti-quorum sensing activity is attempted perhaps for the first time. In this study, we evaluated the effect of lyophilized Chlorella extracts on biofilm formation of P. aeruginosa by modified microdilution assay. Biofilm formation was quantified using MTT assay. The number of surviving bacteria was determined by measuring their ability to reduce tetrazolium to formazan at 570 nm. The minimum biofilm concentration that showed 90% and 50% inhibition of biofilm was calculated. The lyophilized ethanolic extract of Chlorella at a concentration of 2000 μg/ml was found to reduce the biofilm of P. aeruginosa up to 90% (MBIC90), at a concentration of 1000μg/ml was inhibiting 85% of biofilm and at a concentration of 61.25 μg/ml could inhibit 60% biofilm. MBIC50 was at 50 μg/ml. The anti-biofilm activity of the ethanolic extract of Chlorella observed under the light microscope was ascertained through scanning electron microscopy (SEM). The SEM pictures revealed the formation of dense biofilm with a thick mat of bacterial cells in control Fig. 2A. However, in comparison with the control the anti-biofilm activity of ethanolic extract of Chlorella showed a significant reduction in cell density and disturbance in the architecture of the biofilm which is obvious from Fig. 2B confirming the anti-biofilm activity of the extracts. The results of the present work are by the reports from Piper betle leaf ethanolic extracts 10 and extracts of Spirulina platensis 11. The antibacterial activity of the extract was evaluated by disc diffusion assay. The Chlorella extracts didn't show any anti-bacterial activity as there was no significant zone of inhibition around the discs. The ethanolic extracts reduced the biofilm dramatically without inhibiting the growth, which was therefore not due to the reduction of “quorum” but due to the interruption of “sensing” 12. Inhibition of biofilms by ethanolic extract of Chlorella has hence provided an attractive anti-biofilm strategy against P. aeruginosa, which can be resistant to multiple antibiotic agents. The GC MS analysis revealed that Diethyl phthalate at Rt 15.563 (39.28%) and Trimethyl (4-tertbutyl phenoxy) silane at Rt 31.944 (25.63%), as the major compound in the ethanolic extract of Chlorella vulgaris which have been reported to have antibacterial activity 13, 14. The estimation of in-vitro maximal cytotoxic free concentration was done on vero cell line. The extracts were found to be non-toxic at all the concentrations tested. The present study marks the ethanolic extract of Chlorella as a valuable target for developing biofilm inhibitors against P. aeruginosa. CONCLUSION: Chlorella vulgaris is one of the commonest algae having numerous potentials because of its high protein content and carotenoid content. Since, its ability to eradicate biofilms was not reported earlier, the present study was attempted. 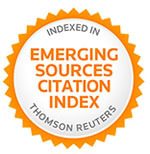 Based on the result obtained in the current study, it is proven that the ethanolic extract of Chlorella demonstrated quorum sensing regulated biofilm inhibition of Pseudomonas aeruginosa (MCC 2080). Since, the extracts are prepared from the Chlorella powders recomm-ended for human consumption, their use to control infectious diseases could be of significant interest. ACKNOWLEDGEMENT: We are grateful to Parry Nutraceuticals for providing the chlorella sample and to Dr. I. Seethalakshmi, Lifeteck Research Centre, Chennai for providing lab facilities. AUTHOR’S CONTRIBUTION: Soundhari. C, (corresponding author) designed the work; the actual laboratory work was carried by Varsha Gayatri K and Pavithra BP (other authors). The manuscript was designed by the authors and carefully reviewed by the corresponding author. de kievit TR and Iglewski BH: Bacterial quorum sensing in pathogenic relationships. Infection and Immunity 2000; 68(9): 4839-4849. Costerton JW, Stewart P and Greenberg EP: Bacterial biofilms: a common cause of persistent infections. Science 1999; 284: 1318–1322. Dutta D, Cole N and Willcox M: Factors influencing the bacterial adhesion to contact lenses. Molecular Vision 2010; 18: 14-21. Rutherford ST and Bassler BL: Bacterial quorum sensing: Its role in virulence and possibilities for its control. Cold Spring Harbor Perspectives in Medicine 2012; 2: 124-27. Soundhari C and Rajarajan S: In-vitro screening of lyophilized extracts of Alpinia galangal and Oldenlandia umbellate L. for antimycobacterial activity. 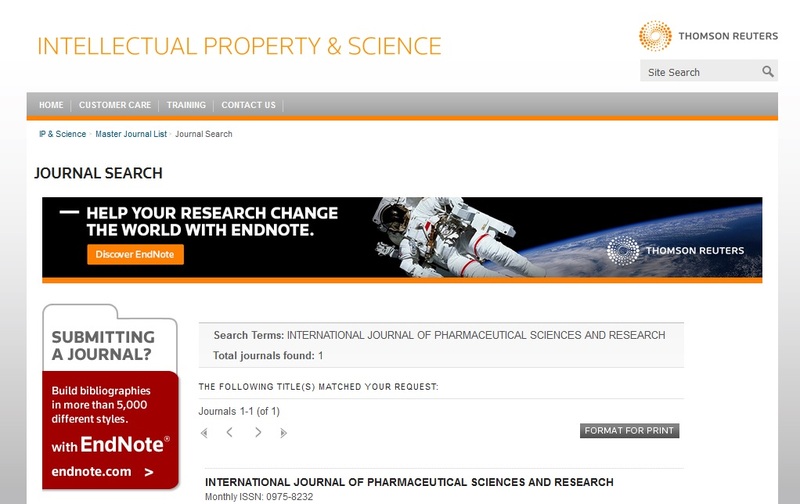 International Journal of Biological and Pharmaceutical Research 2013; 4: 427-432. Teanpsaisan R, Kawsud P, Pahumunto N and Puripattanavong J: Screening for antibacterial and antibiofilm activity in the medicinal plant extracts against oral microorganisms. Journal of Traditional and Complementary Medicine 2017; 7: 172-177. Nithya C, Begum MF and Pandian SK: Marine bacterial isolates inhibit biofilm formation and disrupt mature biofilms of Pseudomonas aeruginosa Microbial Biotechnology 2010; 88: 341-358. Clinical Laboratory Standards Institute, Performance standards for antimicrobial disk susceptibility tests; Approved standard - 9th CLSI document M2-A9. Clinical Laboratory Standards Institute, Wayne, PA, 2006; 26: 1. Raffa RB, Iannuzzo JR, Levine DR, Saeid KK, Schwartz RC, Sucic NT, Terleckyj OD and Young JM: Bacterial communication (‘quorum sensing’) via ligands and receptors: a novel pharmacologic target for the design of antibiotic drugs. Journal of Pharmacology and Experimental Therapeutics 2004; 312: 417-423. Datta S, Jana D, Maity TR, Samanta A and Banerjee R: Piper betle leaf extract affects the quorum sensing and hence virulence of Pseudomonas aeruginosa 3 Biotech 2016; 6: 18. Oscar FL, Nithya C, Bakkiyaraj D, Arunkumar M, Alharbi NS and Thajuddin N: Biofilm inhibitory effect of Spirulina platensis extracts on bacteria of clinical significance. Proceedings of the National Academy of Sciences India. Sect B Biol Sci 2015; 87: 537-544. Choo JH, Rukayadi K and Hwang JK: Inhibition of bacterial quorum sensing by vanilla extract. Letters in Applied Microbiology 2006; 42: 637-641. Premjanu N and Jayanthy C: Antimicrobial activity of diethyl phthalate: an in-silico Asian Journal of Pharmaceutical and Clinical Research 2014; 7: 141-142. Priyanka C, Kumar P, Bankar SP and Karthik L: In-vitro antibacterial activity and gas chromatography-mass spectroscopy analysis of Acacia karoo and Ziziphus mauritiana Journal of Taibah University for Science 2018; 9: 13-19. Gayatri KV, Soundhari C and Pavithra BP: Biofilm inhibitory effect of chlorella extracts on Pseudomonas aeruginosa. Int J Pharm Sci & Res 2019; 10(4): 1966-71. doi: 10.13040/IJPSR.0975-8232.10(4).1966-71. Authors Address: Department of Microbiology, Valliammal College for Women, Chennai, Tamil Nadu, India.